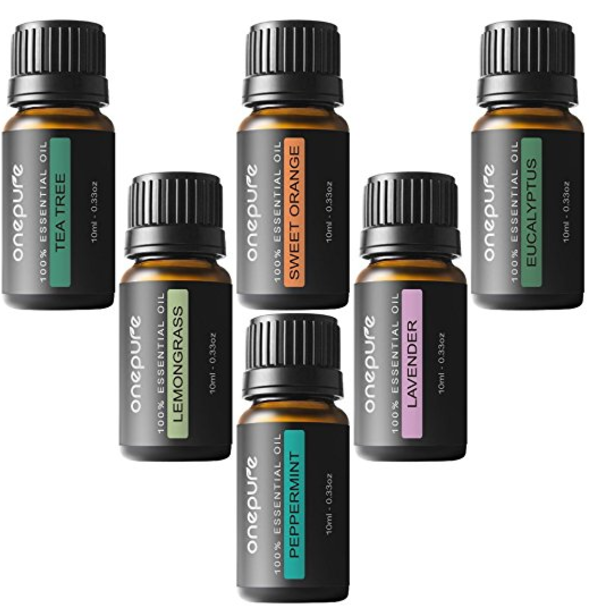 Get this Onepure Aromatherapy Essential Oils Gift Set, 6 Bottles/ 10ml each, 100% Pure & Therapeutic Grade ( Lavender, Tea Tree, Eucalyptus, Lemongrass, Sweet Orange, Peppermint) on sale for $14.95 (Retail $29.95). -Package includes 6 bottles, 10ml each. Flavors included: Tea Tree, Lavender, Eucalyptus Lemongrass, Peppermint and Sweet Orange. -All Onepure oils are 100% Certified Pure Therapeutic Grade Essential Oil. No additives, fillers, bases or carriers added. -Pure essential oils maintain the balance of your body, mind, heart and spirit. It may well be the ultimate gift from nature. -Uses: Aromatherapy, Custom Massage and Body Oils, Vaporizer, Diffusion, Oil Burner, Inhalation, Compress, Perfume, Blends, Spa and Home Care, Cleaning Products. For external use only. -It can be used with essential oil diffuser or humidifier. Adding a few drops of oil combined with water to release a scented vapor into the atmosphere.